On the surface, that activity appears to be a relatively benign one. What could be more innocent than cute youngsters collecting sweets? Halloween, however, is actually one of our only holidays based on extortion. When children scream “trick or treat,” they are essentially demanding candy in exchange for not doing a prank or something else that is nasty. Some children on Halloween are learning how to ask strangers for candy. Learning to interact politely with strangers is a valuable lesson. Other costumed kids, however, are figuring out how to shake down people for sweets and that threats of mischief are sometimes effective ways to get what you want. Is there a better way than extorting people with tricks to get more treats? A number of years ago when my children were young, I ran a simple, economic experiment to find out. We wanted to discover a way to maximize the amount of candy they could collect without threatening adults. Want more candy? Consult an economist. The experiment was important to my children because I tried to never buy them candy. Thus their primary source of candy was this one holiday. If they got a large enough haul at Halloween, they would have enough candy to last till the following one. We lived in a small Ohio town that was perfect for experimenting. The town was divided into three neighborhoods separated by large and busy main roads. The north neighborhood had mansions and millionaires. The central neighborhood was middle-class. The south neighborhood, where we lived, was the poorer part of town. What made the town great for experimenting was that it was possible to walk to all the different sections in a single night if you were interested in answering the question, “Where do you go to get the most candy?” By visiting all the neighborhoods in one evening, variables like weather, economic conditions and the particular day of the week were all taken into account. One year, I was able to convince my children to test all three neighborhoods. At first I tried to persuade them that finding out the answer was important for understanding where in future years they could collect the maximum amount of candy. Even as children of an economist, they were unimpressed by this argument. I ended up promising to buy them enough candy to make up any shortfall if they went along with dad’s wild idea. The results of the experiment were pretty clear. The rich homes offered the largest and nicest pieces of candy. However, there were two problems with ringing doorbells in the wealthy part of town. Relatively few people were home, which meant few places to ask for treats. Additionally, the distance between houses giving out candy was quite large. This meant it took a long time to collect any meaningful amount of candy. Since the rich part of town was clearly a bust, we all agreed to try a different neighborhood. The poorer part of town was also not great for collecting candy. My kids recognized some of their friends, but they felt the candies being given out were not the kind they really liked or wanted to eat for the rest of the year. This is not surprising since Halloween candy is expensive. Americans are expected to spend US$2.7 billion on Halloween candy this year, according to the National Confectioners Association. This means the average U.S. household will be spending $22 on just candy alone. This is about twice as much as the typical poor family spends on food per day. Buying that much candy could cost a low-income household two days of meals! The children loved the middle-class neighborhood. The distance between houses was not that large and many of the houses were giving out all of my children’s favorite candies. The haul was so much they had enough candy to easily last an entire year. So, what lessons did I learn from our little economic experiment? First, extortion isn’t necessary. Instead of letting kids shout “Trick or treat,” encourage children to say “Happy Halloween.” Removing the threat of a trick will likely make no difference to the amount of candy collected since it is an idle threat anyway for (most) children. 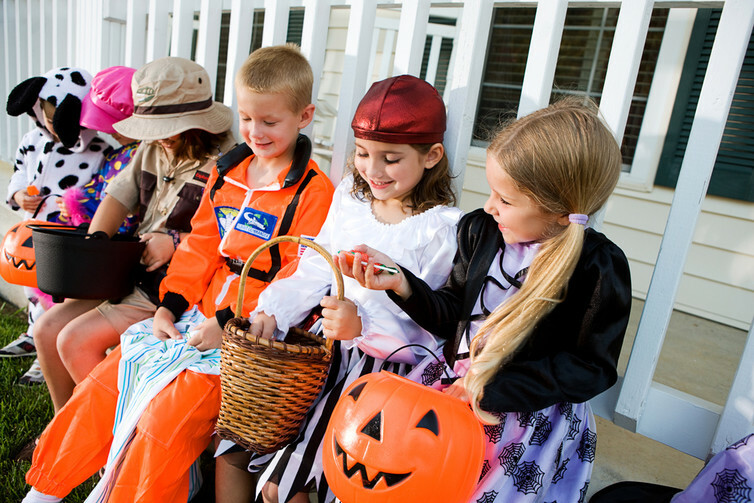 Then take the kids to the neighborhoods with the highest ratio of candy to steps between homes and have a great time. I just ask one small favor. If you or your children get a bellyache or toothache from eating too much candy, don’t blame me.